A relatively new player in an old game, Dallas-based United Leather USA has quickly earned a reputation for bringing traditional styles to modern tastes. Since its founding in 2002, the craftsmen and women here have built an impressive portfolio of lounge chairs, couches, office seating and much more. Down Home Leather Furniture For Your Home! The distinct feature of their pieces is the leather. United Leather uses only 100 percent genuine top-grain leather. Their furniture features a contemporary style that evokes the romance of the American frontier. This is most prominently displayed in their Western Seating collection, where many pieces have unique patterns that make them distinct from any other piece. You can even find furniture with stylish hair-on-hide upholstery for a genuine Texas look. Top-grain leather is highly durable and will stand up to daily use. If you have kids or pets, quality leather furniture is an investment that your entire family will appreciate!built to give you years of comfort. Top grain leather Western Style! Designed and built in Texas, United Leather Furniture is sure to give you years of comfort. Strong frames with timeless styles combine to make stunning furniture for your home. Because the furniture is made in Dallas, TX your custom designed furniture is available without the typical 3-6 month wait! A Gallery Furniture design specialist can help you configure the furniture of your dreams and have it delivered in just a few weeks! If you want rolled arms, nailhead trim, or have been dreaming of a blue sofa – all these are possible! Gallery Furniture is proud to partner with United Leather USA to provide the very best leather furniture to our customers. In addition to these more timeless designs, United Leather USA specializes in cinema-style seating. All their home theater furniture is designed to satisfy all your senses. Enjoy your favorite movies and television shows from the comfort of your home. Your home theater seating should be as sophisticated as your electronics. When you custom order home theater you can also choose the exact accessories your family needs. Integrated cup holders and storage compartments will make your home theater experience even better. Luxurious custom designed furniture is in your reach with the flexible financing options offered by Gallery Furniture. 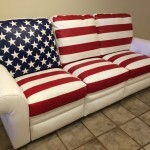 Buying furniture that is Made in America is good for your home, good for your wallet, and good for America. Make a rustic statement or add a contemporary flair to your family room with American Made furniture you will be proud to own.